A cheap wood burning stove can deliver inexpensive home heating. Here are some strategies for finding a cheap wood burning stove, including a look at second hand stoves and the best stoves to buy for durability and long life. One way to improve your home is to obtain and install a cheap wood stove. However, a good, inexpensive wood burning stove is not so easy to find. Even a stove from the lower end of the price spectrum is likely to cost you several hundred pounds or dollars. However, wood burning stoves can be cheap to run. A well-chosen wood-burner looks fantastic and offers cosy warmth which percolates through the house. 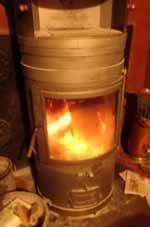 This page takes a look at some of the options for cheap home heating using a wood stove. However there are pitfalls and false economies to avoid. 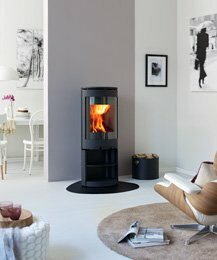 Picture, right: A Jøtul wood burning stove - beautiful and efficient! The best wood burner buy for your home will be one that's the right size for your home. A wood burner which is too small will be unsatisfactory because your house will not be warm enough during those critical winter months when a decent source of heat is essential. There's a temptation to burn the stove as hot as possible to make up for its inadequate size. This will most likely result in damage to the stove sooner or later. This is not the best route to find a cheap wood burning stove! If you buy a cheap second-hand wood burner which is overly large, you may find that you are burning more wood than you intended and heat is being wasted. Alternatively, a large stove kept at a smoulder will not burn so cleanly. So how do you estimate the optimum size to buy a wood burner? To select a good, cheap wood burning stove you need to understand how much heat you need - which depends, in part, on the size of your home. Whether you are looking to buy a cheap wood burner or you are looking to save money in the long run with a quality wood burner, you need to consider all of the following points. How large is the room in which the wood burner is to be? Is your home open plan or do you just plan to heat a single room? A large wood burner can easily generate enough heat for several rooms - but only if the air flow around your home is conducive to this. One over-hot room in order to keep other rooms bearable is not so efficient - or cheap, though it is certainly an option if you have your own wood. The French wood burner shown right generates lots of heat from locally sourced and ecologically managed wood - but it takes time to chop. Some wood stove websites have a handy room size calculator to help you find the best stove for you. You enter the size of your room and the calculator tells you what output to look for in a stove. While this is well worth doing, it's also good to double check by actually speaking to a knowledgeable merchant. Some wood burners can run a central heating system. This is something to bear in mind if you are hoping to heat your whole house. Of course, the costs of starting up such a system are going to be higher. If you buy a multi-fuel stove, you may enjoy greater flexibility; you can still burn mainly wood, if that is what you choose. Is your cheap wood burning stove going to be ancillary heating - or is it going to be the main heat source for your home? All these questions must be thought about in order to decide on the best options for your home. 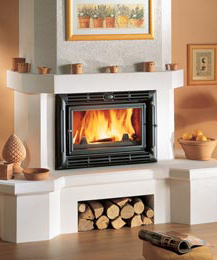 How deep and high is the space in which you want to put your wood burner? Many wood burners are put into an existing chimney inglenook. In modern homes - and some older properties these can be on the small side for accommodating a large stove. Insert wood burners are more efficient in the use of space. You also need to know that your existing chimney is suitable for use with a wood burner. Do you know whether the chimney works properly? In all weathers and all wind directions? Most chimneys are affected by things such as nearby trees and buildings. In the US it is now a requirement that wood stoves have a stainless steel chimney liner fitted from the stove to the top of the chimney. This is for safety. In the UK a variety of solutions exist. People often have their chimneys lined - which fire-proofs them and makes them draw more efficiently. You still need a connecting part from the stove to the chimney - and again, this is often made from stainless steel. Take professional advice before you commit yourself to a purchase. Wood burners tend to be expensive and the best ones are typically made from cast iron. There are cheaper ones which may work perfectly well. The more expensive models are more likely (on the whole) to give good service without problems for years. If you are looking to buy a cheap wood burning stove, it pays to examine the quality of fixtures and fittings. Make sure that the doors fit snugly and the tools, such as handles for riddling ash or adjusting air flow are sturdy and well made. Scandinavian makes are often very good. In Scandinavia the winters can fierce, so a good stove is an essential household item. We used to have a Jøtul stove - in a previous house. It was excellent and beautiful, too. Wood burning stoves come in may shapes and sizes; you can even get a specialist stove for installation in a workshop. These are able to run off fuels such as wood chips and sawdust. One big advantage if you are keen on DIY is that you can use up your waste wood and sawdust to keep warm. You can also buy wood burning stoves which are suitable for outside use - see the Amazon ad to the left. I've not tried these. The pot bellied stove tends to be relatively cheap and cheerful - and it has a certain quaint charm. They tend to be suitable for relatively small spaces. Amazon has a surprisingly wide range of wood burning stoves for sale, including several that are really quite low cost. Unfortunately, I cannot comment on how good these cheap wood burning stoves are as I have not used any of them. They also stock some more expensive models. Most people buy wood burners for the home that are a little more genteel - and efficient - than a pot bellied stove. Picture, right: A Jøtul insert wood burning stove - beautiful and efficient! For a really wonderful modern approach, an insert stove looks great. These stoves sit in the wall, flush. You can even get ones which can be seen from two adjacent rooms. The airwashed glass windows offer good visibility and they are designed to be more or less self-cleaning. Insert stoves generally have the disadvantage that there is less surface area from which heat can be radiated. Some make up for this by having sophisticated heat channels which release warm air directly into the room. Insert wood burning stoves do not tend to be cheap but should pay for themselves over many years of service. Many of the better woodburners (such as Jøtul and Morso) include "clean burn" technology. What this means is that up to 90% of the smoke and particles produced by combustion are efficiently burnt to produce heat. Wood burning stove or multi-fuel stove? For many people a multi-fuel stove may be a better choice, allowing as it does the use of different fuel sources. If you live in the neighbourhood of a large wood or near to a sawmill, or if you have access to a good supply of bought wood, a wood burning stovemay be the logical choice. Wood is a more eco-friendly fuel than coal or coke, so on this basis a wood burner is a superior choice. It is almost carbon-neutral because wood locks up carbon as it grows and releases it again when it is burnt. It's worth considering the availability of wood all year round. It's quite a pain if you cannot obtain it easily, or if the price is exorbitant. The most effective way of getting cheap wood is often to have your own nearby woodland. Wood pellet stoves are increasingly popular but they are by no means a cheap wood burning stove. It's worth thinking about the shape you would like your wood stove to be. Our Jøtul, mentioned above was shaped like a long box, which is good in terms of the drawing power of the chimney and it's good because Jøtul incorporate a kind of baffle to let the heat circulate for maximum efficiency inside the stove. But the shape is terrible if you have only a shallow inglenook to place it in. Take accurate measurements of your inglenook before you go to look at any stoves. You may also need to leave some space for the chimney fittings, depending upon the design of you stove and the type of chimney lining you have - or want. A cheap wood burning stove - but just for outdoor use - from Amazon We had our chimney lined with volcanic ash mix. It was the best solution available in our stone cottage. The Jøtul linked to the chimney by a lined steel tube - an expensive but efficient solution. Whatever shape of stove you like the look of, make sure that you take advice as to how practical it is for your situation. Pot-bellied stoves, for example, look charming but may have a far lower capacity than most box-shaped fires. And while they are a relatively cheap wood burning stove, they are not so efficient as many other designs. A cheap wood burning stove can be a great asset in the garden - for outdoor living on chilly nights. In my book, an open fire is more fun but not every one values the mess! Outdoor stoves, like the one shown, may be a far greener solution to outdoor heating than the bottled gas heaters which have become so prevalent. Chimeneas and fire pits are also good value. Many such traditional outdoor heaters can be used to cook on, at least for barbeques. For regular outdoor cooking probably the most efficient design is the rocket stove. Wood burning stoves can often be purchased second hand. You need to scour the small ads for this. Also, keep an eye out on the small ads down your local shops. This is by no means a sure-fire route to finding a cheap wood burning stove - as decent stoves come up for sale only infrequently. Another option is to check your Yellow pages for second hand retailers, reclamation yards. Your local stove dealership may know of second hand stoves, too. After all, they are selling and often installing woodburners, so they will sometimes have customers who are upgrading. Cheap new multi-fuel stoves are now available from The Range - UK only. You can buy a fairly decent-looking wood burning stove from around £200. This might be a good way to secure a woodburner if you have a limited budget, or if you only need the stove for occasional use. Machine Mart also offers similar products, as well as traditional pot-bellied stoves. If you are thinking of buying a cheap wood burning stove or a multi-fuel stove, always check out how much installation and suitable flues will cost; this can add a lot to the overall price!